Controlling access: They let you control which users are able to access which templates. Organizing templates: They make it easier to keep track of all your forms by organizing them by function or by some other convenient distinction. For instance, suppose your GoFormz account has some human resources form templates and some form templates to be used during fieldwork. In this scenario, you may want to set up two template folders called “Field Forms” and “HR Forms”, then set up your permissions so that your HR employees only have access to the HR templates, and field techs only have access to the field technician templates. Finally, place the appropriate forms in each folder to complete the setup. See here for more on how users, groups, and permissions work in GoFormz, including a detailed use case. To create a new template folder, click the New Folder button at the top of the Templates Tab to launch the New Folder dialog box. In the dialog box, enter a name for the folder and click Save. Your new folder will immediately appear in the Templates Tab. 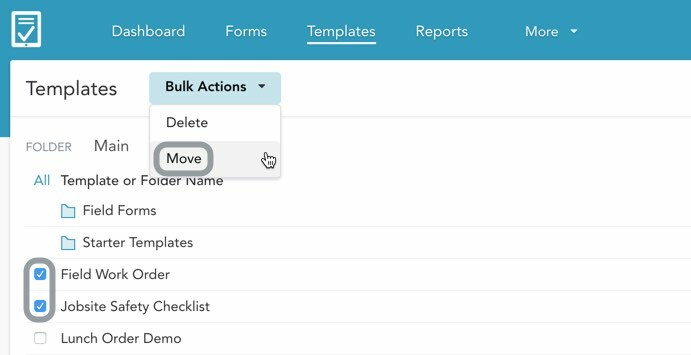 To move one or more form templates from one folder to another, check the boxes next to the templates that you want to move. In this example, we’ve selected the Field Work Order and Job Safety Checklist templates. Then select Move from the Bulk Actions menu at the top. In the Move To Folder dialog that appears, select the destination folder and click Move. If you want to move the selected templates to the top level, choose "Root Folder" from the dropdown. To rename an existing template folder, expand the [...] Actions dropdown next to it and select Edit. You will see an Edit Folder dialog. Change the folder's name and click Save. To delete a folder, expand the [...] Actions dropdown next to it and select Delete. Then click Yes in the confirmation dialog box. Deleting a folder will not delete any of the templates in the group — it will simply move those templates out of the group to the top level.